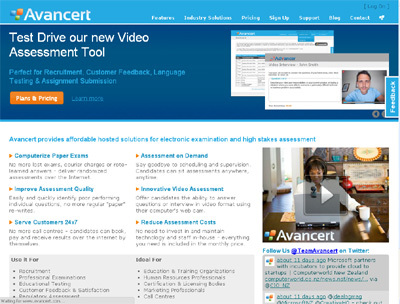 Avancert.com is a SaaS platform that provides everything organizations need for examination, assessment, video interview and testing. All features are provided via a web browser based interface and range from question bank and candidate management right through to sitting management and accepting online payment. Additional new forms of assessment based around video using the candidates home computer, web browser and web camera. Traditionally, smaller organizations have lacked the financial resources and knowledge to bring together a number of different shrink wrapped packages to deliver computer based testing and assessment. Being an ‘end to end’ solution that doesn’t require expensive in-house infrastructure or complex integration skills, Avancert.com makes computer based assessment accessible and affordable to organizations of all sizes. Not only that, but it helps organizations reduce instances of cheating (assessments are completely randomized and different each time taken) improve assessment quality via built in question performance reporting.